Everyone loves a good mystery, unless, of course, that mystery has to do with something important that's missing from your valuable circuit boards! We often discuss methods of repairing circuit boards, and things that are already on the board - but what about replacing surface mount pads that were never there to begin with? Here's a mystery that could well be called Case of the Missing SMT Pads, and in this example, "Whodunit" wasn't as important as "Who's-gonna-fix-it in time to meet a shipping deadline. Apparently, a military contractor had a problem. Some SMT pads were missing from some circuit board assemblies. No one could say for sure how or why they had seemingly vanished into thin air, but unless we could reliably place 2 SMT pads on a batch of boards, missiles were not going to fly. In essence, this customer needed two new SMT pads so that a chip capacitor could be installed between a surface signal trace and a ground layer. Surface wires were unacceptable. Look at Figure 1 and you'll see where two SMT pads were missing. Adding a pad on the left side was a relatively simple matter, and only required a surface connection to the conductor. Figure 1: Pads were missing and needed to be replaced in the locations outlined. The pad on the right side, however, was another matter. It not only needed to be added, but also needed to be connected to the power connection below the surface of the circuit board. The first step was to prepare the area. A milling machine outfitted with a .025" end mill was used to accurately remove the thin surface coating at the two individual pad locations, and to cut out the section of the conductor where the new pad on the left would be added. The milling machine was then used to spot face down to the ground plane at the two circular locations shown to the right of the right side pad. (See Figure 2.) This milling procedure is a delicate step and was completed using the precision of a milling machine while the circuit board was properly fixtured. Next, the short length of solder mask covering both ends of the severed conductor were scraped away to expose the conductor surface. The two circular spot faced holes, and both ends of the prepared conductor, were then tinned with solder. This was followed by proper cleaning to remove flux residues. Figure 2: A milling machine and .025" end mill was used to cut out the section of the conductor where the new pad on the left would be added and to spot face down to the ground plane at the two circular locations shown to the right. 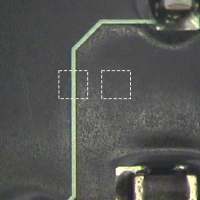 A replacement adhesive-backed surface mount pad was then selected, one that had short lengths of conductor protruding from opposite sides of the pad. These conductors naturally lined up with the conductors on the circuit board surface. 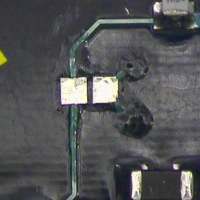 A second adhesive-backed replacement surface mount pad was selected that also had short lengths of conductor that lined up with the spot faced areas. The adhesive backed coating was removed from the short sections of the new pads that would be lap soldered in a later step. Let me take a moment to explain what these pads are. They are not simply pads, but actually a pad replacement system. They are dry-film epoxy backed replacement copper SMT pads, and are hot bonded to the circuit board surface, a better method than attempting to work with messy liquid epoxies on such small items. This method of SMT pad replacement is covered in the IPC repair/rework guidebook. To accomplish the pad bonding, the new surface mount pads were placed in position on the board surface and temporarily held in place with high temperature tape. After a quick heat application to tack the pad in place, the tape was removed. A bonding system was then used to apply heat and pressure to the new pads to thermally bond them to the board surface. Figure 3: New pads bonded in place, lap soldered, and joint sealed with high strength, thermoset epoxy. The system uses special flat tips to cure the adhesive backing in 30 seconds at 500 degrees F. This simple 30-second bonding fully cured the B-staged adhesive backing on the new pads, to reliably bond them to the circuit board surface. 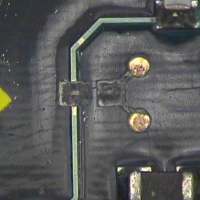 Once bonding was accomplished, the connecting conductors on the new pads were then lap soldered to the pre-tinned conductors and spot face areas on the circuit board. This soldering procedure was followed by a thorough cleaning.